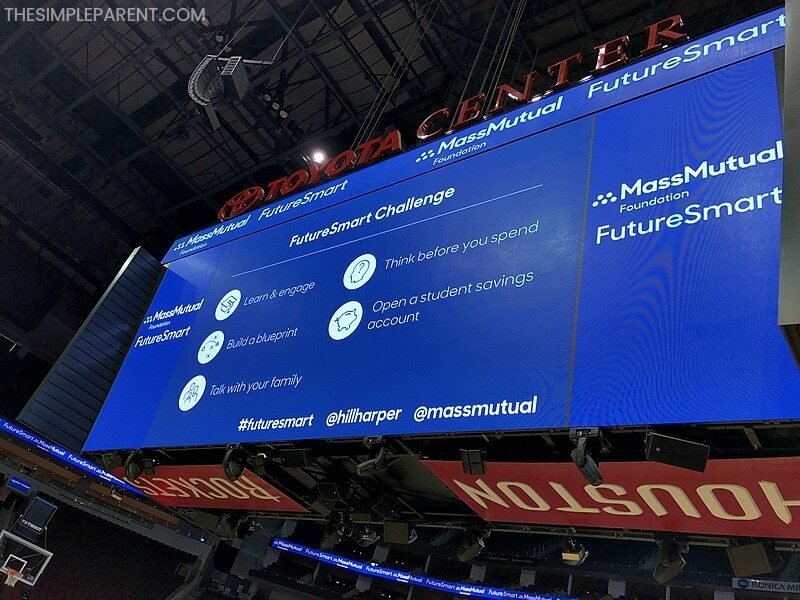 Earlier this month, I had the opportunity to partner with MassMutual and attend the FutureSmart event here in Houston, TX. Future Smart is all about teaching kids about money! As a former teacher and a mother, financial education is important to me! I think that it’s important to teach our kids about money and finances when they’re young. If they know more, they can start their own lives on the right foot! 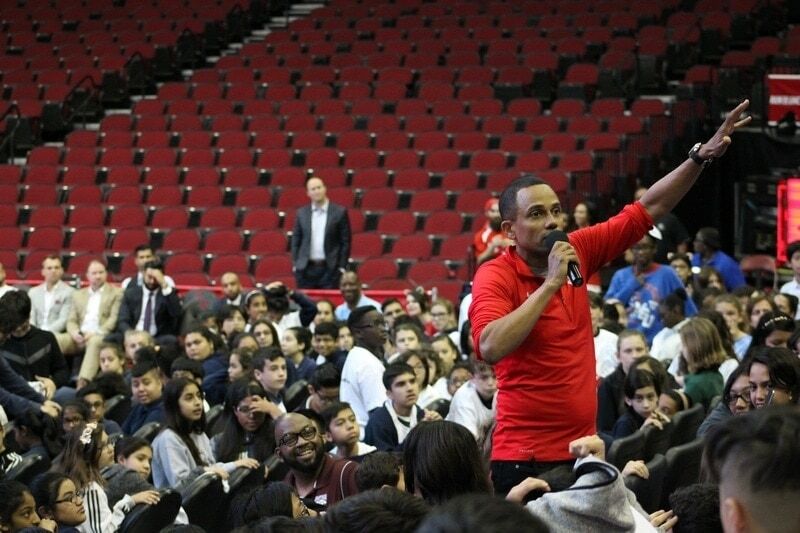 MassMutual has partnered with local NBA basketball teams and actor and author Hill Harper to bring the FutureSmart program to students across the country. The program is designed for middle school and high school students. 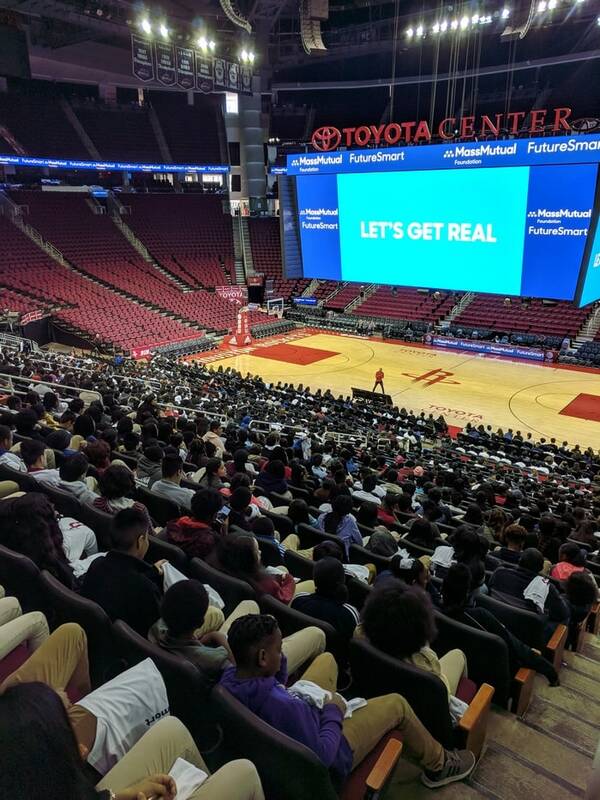 I had the opportunity to spend the morning with over 2,000 local middle school students at the Toyota Center in downtown Houston. Engaging and Learning – Education and knowledge are key to our kids being successful with money when they’re adults. Hill Harper talked about the real costs of higher education and also showed kids how they could up their earning potential with education. Smart Money versus Dumb Money – Hill Harper helped the kids start to differentiate between things that are smart to spend their money on. He encouraged them to start thinking before they spend. Power of Saving – MassMutual provided information on how saving can add up over the years. It was actually a great reminder to me as an adult too. There is power in saving money and the earlier our kids start, the more of an impact it can have on their lives! There was a time in my life when my family was living paycheck to paycheck. We had a chunk of debt on our shoulders and even as a teenager I saw how hard my mom was working to make things happen. While I didn’t know a lot about anything financial, I saw how hard she worked just to make ends meet. It led me to get a summer job when I could and once I was 16, I also worked during the school year. I have worked since then. My own experience has shown me that kids are ready for financial knowledge. Teaching kids about money is an important part of setting them up to be successful in life! Kids love money. Even my kids love money and they’re nowhere near their teenage years yet! Kids are just like us, they understand from a young age that money makes things happen in this world. So watching Hill Harper teaching kids about money was extremely inspirational. I watched him reach out and connect with a basketball arena full of 2,000 middle school kids. I could feel the energy in the room. I could tell that he was making a connection. 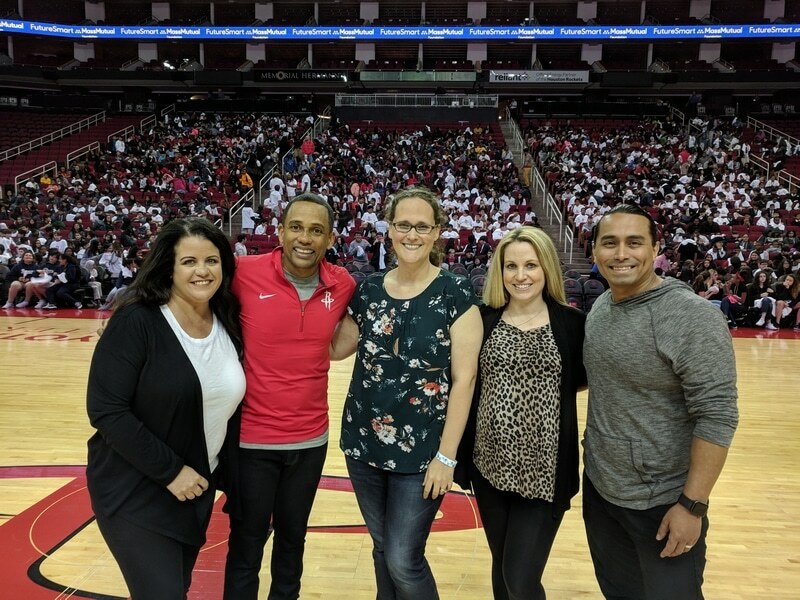 With help from former Houston Rockets player Maurice Taylor and members from the Houston Rockets’ Power Dancers and Launch Crew, Hill Harper engaged the kids for over an hour! They participated and their excitement built as he handed out money to those who were paying attention and could answer his questions. He showed the entire arena that getting kids to engage and participate is the way to reach them. And they’re ready to learn about money! Knowledge is definitely power when it comes to money and finances. 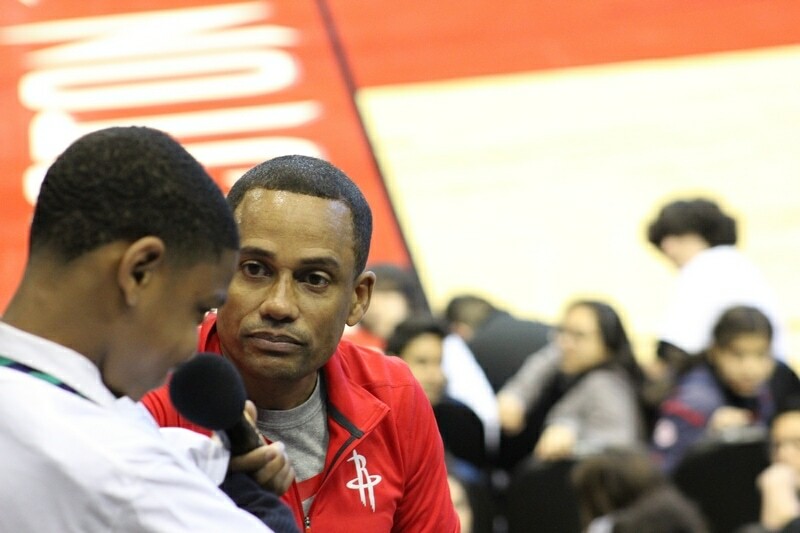 I saw proof of that in my morning spent with Hill Harper and the Houston Rockets’ team that supported him. The amazing thing is that the MassMutual Foundation has a goal to reach 2 million students by 2020! Ove the past few years, they’ve teamed up with select NBA teams and local Junior Achievement programs to hold the interactive events and have educated over 40,000 students across 17 major cities! But the FutureSmart program is an interactive course that goes beyond the special events and is available for students everywhere! If you’re interested in bringing the FutureSmart program to middle school or high school, visit the FutureSmart website to get more information! « 3 Ingredient Sugar Cookies You Can Make in Minutes!